To discover stroller-friendly trails near you, go to Trails.com or Localhikes.com, or go to the map feature on your phone and pinpoint your current location. Then search for any large green patch close by, which usually indicates a park. Find the name of the park and go to the parks official website, you can usually find trail maps, trail information, etc. You may also need to change your mind set about what is “stroller-friendly”. There could be a rocky trail near you that you wouldn’t have considered pushing a stroller up but you will never know if you can do it until you try. If possible, ensure you get a stroller with a hand brake. Note, if you are purchasing an older model jogging stroller second hand, they might not have a hand brake. Therefore, ensure you wear the safety strap tightly around your wrist when running on the trails to help stop the stroller easier. 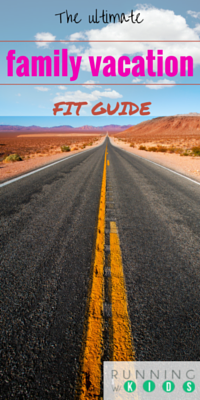 #5: It’s all about that form, bout’ the form, no walking. When going up steep hills, lean into the stroller and straighten your arms so all the weight isn’t in your biceps and keep moving. You need forward momentum to keep that stroller from rolling backwards so don’t stop until you get to the top! 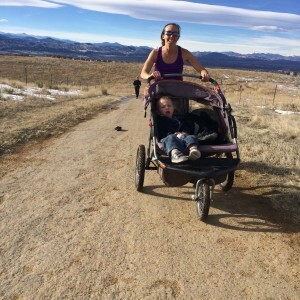 If RWK contributor Caitlin can trail run pushing 3 kids, so can you! When running on steep downhill’s with a jogging stroller, lean back slightly and take short, quick steps. Let your quads do the work to slow you down. #6: Learn how to do high rocks and stairs. You can push a jogging stroller, especially a single jogger on most hiking trails- it just depends on how adventurous you are. If you come up on some rocky sections, don’t turn back. Here are a couple tips that will help you conquer those rocks and keep on trekking! Lift the front tire up the rock and once it is on top or over the rock lift the back tires up and over, repeat this motion until you are over the rocks or up the stairs. This isn’t fast but it works. If you look like you are inch-worming the stroller up the rocks then you are doing it right. Just think about how much of a great upper body workout you are getting! The point of trail running is to access places deep in nature. Take this time to immerse yourself in the beauty and sounds of wildlife all around you. This is also the perfect opportunity to connect with your kids on a more fundamental level. I Spy is a great one to play when on trails. Help to expand their world by expanding yours! Now it is time to get out and rock those trails. We’d love to hear about your favorite local stroller friendly hiking or jogging trail. RWK founder, competitive trail runner and mom to 2 trail loving boys!